There are only five categories of accepted, standard breed colors for Yorkshire Terriers and these are the only coloring choices available on the American Kennel Club (AKC) application form for registering a Yorkshire Terrier. These accepted colorings include: black and tan, black and gold, blue and gold, and blue and tan, and since the year 2000, parti-colored coats can now be registered. Dogs born with atypical coats colors or textures would not intentionally be bred as very fine coated or wooly coats can create more difficulty grooming. 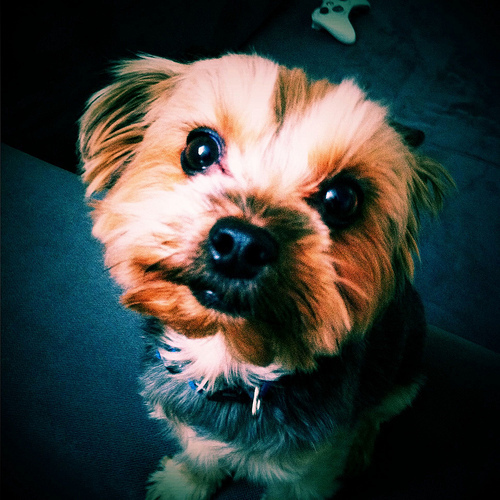 As well, one of the more serious reasons given for not breeding Yorkshire Terriers that do not adhere to the standard color patterns, or who are considered “off-colored” Yorkshire Terriers, is that an unusual color of the coat could be a potential indicator of a genetic defect that may affect the dog’s health. Therefore, careful and conscientious breeders will not wish to continue a breeding line that may perpetuate genetic defects. If a puppy is born with an off-colored, wooly or very fine coat, careful veterinarian health screening can determine if any health risks exist and they would not be considered show standard. A newborn Yorkshire Terrier puppy is born almost entirely black with tan points showing inside the ears, above the eyes, on the muzzle, around the legs, feet and toes, and the underside of the tail. 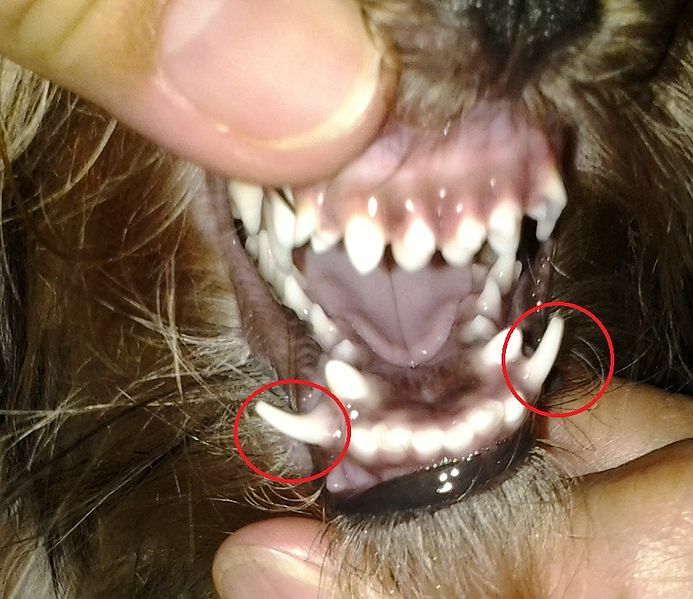 Occasionally a Yorkshire Terrier puppy may be born with a white “star” on the chest or displaying white below the mouth or on one or more toes. Many breeders agree that a white mark on the chest of a puppy is indicative that the puppy will grow a long full coat in adulthood. These markings generally fade quickly, having totally disappeared within a few months. Also, a few Yorkshire Terriers are born with a reddish tint in their coat. It is also common to find a white patch on one or more nails. These markings fade with age, and are usually gone within a few months. As it may take two to three years or more for the Yorkshire Terrier coat to attain its final color, choosing a coloring for American Kennel Club (AKC) registration purposes will be a best guess for the new puppy owner, although breeders who know their lines well, should be able to fairly accurately predict the final adult coat coloring of their puppies, which will usually be a black/grayish color. Although breed standards are always changing and new color combinations being accepted into registries, the show world can be somewhat testy about such seemingly insignificant details as coat color. As an example, P. H. Combs, writing in the late 1800’s, complained about show wins awarded to puppies, when the dog’s coat does not fully come in until three or four years old, “and the honor of winning such a prize (for a puppy) can therefore be of but little practical benefit to the owner” since the adult dog’s color cannot be exactly predicted. The official coat standard for Yorkshire Terriers, which is dictated to the American Kennel Club (AKC) by the Yorkshire Terrier Club of America (YTCA) is that of a glossy, fine, and silky coat that is perfectly straight, being long on the face and moderately long on the body. The approved breed standard is defined as perfection in a Yorkshire Terrier and it’s this perfection that all responsible breeders strive to produce. In pursuit of this defined perfection, any Yorkshire Terrier that deviates more than slightly from this standard would not be considered breeding quality. Of course, not every Yorkshire Terrier is born perfect because throwbacks can suddenly spring up out of genes from the original DNA of the dogs that were bred to create the breed, and since all three of the breeds believed to be responsible for the creation of the Yorkshire Terrier breed are now extinct, reliable information concerning the origins of the Yorkshire Terrier is questionable. 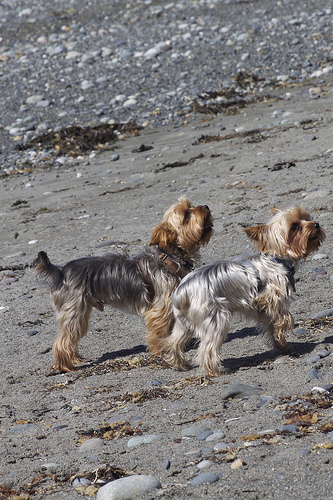 Yorkshire Terriers with cottony coats usually have a large quantity of hair from the time they are newborn puppies and as they grow, the hair continues to grow in length and bulk. 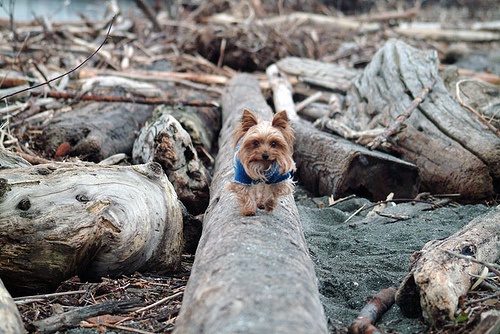 Due to the bulkiness of this type of cotton or wooly coat, a Yorkshire Terrier with this type of coat will appear to be almost twice as large as he or she actually is. Although a wooly or cotton coated Yorkshire Terrier may well have the correct coat color and length, no matter how much you may fuss and groom, they will never attain the appearance of the the silky-haired breed standard show dog. Red-legged Yorkshire Terriers, are also called wiry or short coated Yorkshire Terriers and these names refer to dogs with hair that never grows long. The coat length on these dogs can be anywhere from two to six inches any everywhere in between with the hair on the face of a red-legged dog usually growing longer than the hair on the body. The legs tend to be very dark in color, with deep, rich tans that in natural light will appear almost reddish colored, while the black in the coat is a true black that rarely turns the traditional Yorkshire Terrier steel blue color. Some breeders say that those originally creating the breed used red legged Yorkshire Terriers to add color and proper coat texture back in to their breeding lines. Parti colors, (white with black/blue and tan) exist, as do liver or chocolate colored Yorkshire Terriers, although many are not considered correct for the breed standard because the breed is defined by its color, and therefore, non-standard colors may indicate health problems or cross-breeding. 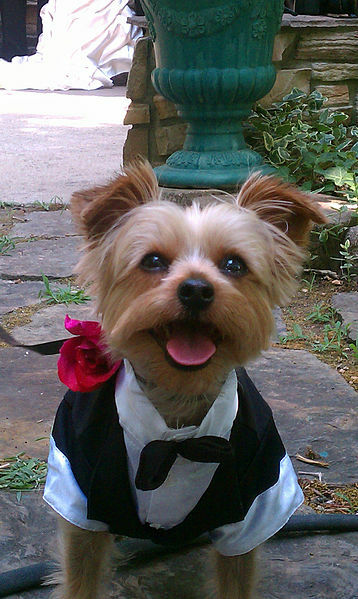 It is quite rare to find a Yorkshire Terrier with a parti colored coat and if one is found, due to it’s unique coloring, it will likely be very expensive. 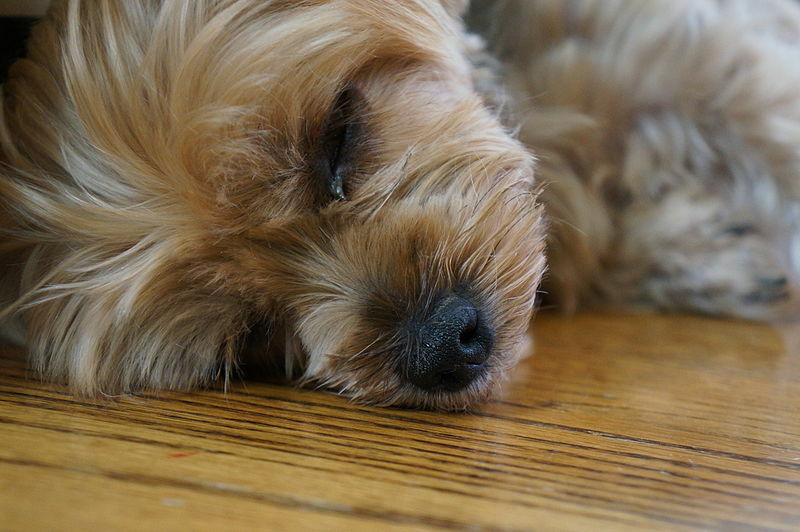 Some Yorkshire Terriers are unable to produce the black pigment in their coat, and are therefore a brown color referred to as liver or chocolate. The American Kennel Club (AKC) registration form for Yorkshire Terriers has, up until quite recently, when it permitted the registration of parti colored dogs is the year 2000, permitted only four choices: blue and tan, blue and gold, black and tan, black and gold. Of course, color alone will have no affect upon whether or not a dog is a good companion and pet. Even though you do not often see non-standard or off-colored Yorkshire Terriers, because of their unusual color pattern, they will often be advertised at premium prices, as highly desirable, exotic, designer pets. 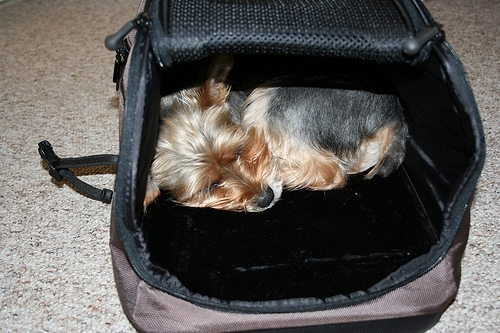 Although the American Kennel Club will not deny registration of a Yorkshire Terrier based on color alone, the Yorkshire Terrier Club of America has a directive which states that “any solid color or combination of colors other than black and tan” for adult dogs is a disqualification, and “dogs of solid color, unusual combination of colors, and parti colors should be disqualified” from showing in AKC sanctioned dog shows because of the white coloring. Piebald or TRI-colored Yorkshire Terriers have been around for as long as the breed and were considered a disqualification of the breed, which meant that breeders either destroyed them or gave them away as pets. With the dawning of the “designer dog” age, where owners have become more interested in unique colors and patterns, breeders have become more interested in the piebald coloring presented in the Tri Yorkie, or Biewer Yorkshire Terrier. In 1984 a piebald Yorkshire Terrier was born as a result of a genetic recessive gene occurrence from two German Yorkshire Terriers born at the Friedheck kennel. Today, although much controversy remains around the subject, the piebald dogs are considered a different breed in Germany because the German registrations would not permit the then described TRI or Banded colored Yorkshire Terrier into their registration, as the Registries in the United States do. As a result, a separate registry was formed in Germany which was given the breed classification of Biewer Yorkshire Terrier. Had the German Breed Club allowed the TRI or banded colored Yorkshire Terrier to be registered, then the Biewer Breed would not exist to this day and would instead be simply named Tri Colored Yorkshire Terriers. Werner Biewer found this original piebald puppy to be quite beautiful and began a selective breeding program to produce more piebald puppies. The breed was officially recognized in 1986 by the Allgemeiner Club der Hundefreunde Deutschland (ACH). In the United States, owners purchasing tri colored puppies from Nikkos kennels (the Lipmans), who were breeding champion Yorkshire Terriers, wanted their tri colored dogs registered with the AKC. 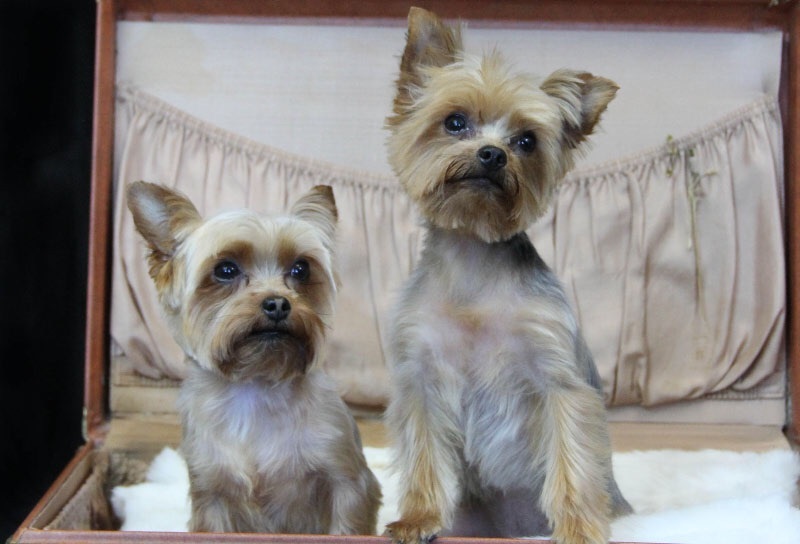 As these dogs were born from two AKC registered dogs and they wanted the right color to be shown on the papers (Black, white and tan), in the year 2000, after 18 months of DNA testing, the American Kennel Club (AKC) finally accepted the tri- colored Yorkshire Terrier into their registry. The amazing color transformation that occurs from the newly-born black-and-tan puppy to the adult blue-and-tan is affected by many factors, the most predominant being that which will be inherited by the combination of the puppy’s inherited genes from its sire & dam at conception. Thereafter the final coat color of the Yorkie puppy will be determined by the health of the glandular system that supplies pigment to the puppy’s hair, skin, eyes, eye rims, nose, and toenails. There is little doubt that whatever the final coat color may be, the Yorkie puppy will be an adorable and well loved companion. Nice site thanks! Our little 4 year old was born with short facial hair while his sisters were normal. He is gaining gray whiskers around and on his chin any concern for his health?